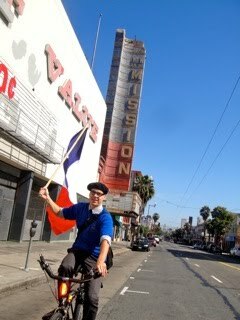 Vélo Vogue: Vive la France! ¡Que Viva Mexico! Long Live Ireland! Vive la France! ¡Que Viva Mexico! Long Live Ireland! 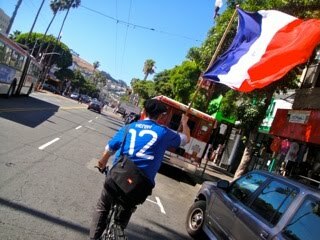 It was pretty damn hilarious biking down Mission Street this morning, documenting my friend’s rather bold display of patriotisme prior to the Mexico/France World Cup match. We saw lots of smiles and heard lots of honks and shouts of ¡Viva Mexico! Meli sent me this blogpost from MissionMission just now and it kind of reminds me of the madness that I was up to today (though I didn't parade through the Mission or Sunset Districts, just in the FiDi). I also didn't watch the game at a French bar, and found myself surrounded by Mexico fans. Je ne vois pas de problème! I think we can all just get along, non? Look - France is sucking couilles during this Cup, but there's nothing wrong with supporting your team. It's a sport, and I know a lot of people have been killed because of it, wars have broken out and a lot of nationalistic/racist attitudes are displayed, but this brave soul's love for his team, as he rides peacefully, almost humorously down Mission Street wearing his team's colors, does not seem offensive or asking for trouble to me. He's riding his BIKE (ouais! ), waving the tricolor flag with smile on his face, and excited for his team. C'est tout! So lighten up folks, pop open a cervezita and enjoy the Beautiful Game. You got the wrong French. We have the World Worse Soccer Team... forget about it. To meet French cyclist, prefer Barbara Buatois who is silently entering by the big door in RAAM (Race Accross the Americas) history. Tomorrow she will win the female category and finish nicely in the top of the overall result. Merci pour votre visite, Luc! I am currently rooting for the good ol' USA now!